The Denver Broncos were fighting to stay in the AFC West playoff hunt as they faced the Pittsburgh Steelers on November 18, 1973. Coached by John Ralston, the Broncos had overcome a slow start to compile a 4-3-2 record thus far. Veteran QB Charley Johnson effectively directed the offense that included HB Floyd Little (pictured at right) and TE Riley Odoms, who was breaking out in his third season. The Steelers, under Head Coach Chuck Noll, were at 8-1 and had won four straight games and 13 in a row at home. However, they were also having injury problems and were without QB Terry Bradshaw and HB John “French” Fuqua, while DT “Mean Joe” Greene was suffering from a back injury and would not be in the starting lineup for the first time in his career (he did enter the game in the fourth quarter to spell his replacement, DT Tom Keating). There were 48,580 fans in attendance at Three Rivers Stadium and they saw the home team run into trouble at the very start. HB Rocky Bleier fumbled while returning the opening kickoff and DB Maurice Tyler recovered to give the Broncos possession at the Pittsburgh 15. They weren’t able to move the ball, but Jim Turner kicked a 32-yard field goal to give Denver the early 3-0 advantage. The Steelers responded with a series in which QB Terry Hanratty completed passes of nine yards to HB Preston Pearson and 22 yards to WR Ron Shanklin, but after reaching the Denver 16 they came up empty when Roy Gerela was wide on a 23-yard field goal try. Later in the period, Pittsburgh again advanced deep into Denver territory, the key plays being a Hanratty completion to TE John McMakin for 44 yards and a 17-yard run by FB Franco Harris on a sweep. This time Gerala tied the score with a 15-yard field goal. Turner attempted a long field goal for the Broncos from 52 yards early in the second quarter, but it was short. The Steelers were on the move again when Hanratty threw to WR Frank Lewis for a 40-yard gain. Again having to try for a field goal, Gerela was successful from 18 yards but DE Lyle Alzado was penalized for roughing-the-kicker and Pittsburgh chose to take the points off the board and keep the ball. Shortly thereafter they ended up having to call on Gerela again, and he was again good from 13 yards. Late in the period, the Broncos threatened, reaching the Pittsburgh four with a 69-yard advance before having to settle for a Turner field goal from 11 yards and the teams were tied at 6-6 going into halftime. Denver HB Otis Armstrong returned the second half kickoff 32 yards and that spurred the Broncos to a 10-play, 67-yard drive, helped along by a 25-yard pass interference penalty on CB Mel Blount. Floyd Little ran the last ten yards for a touchdown and Turner converted to put the visitors up by 13-6. Early in the fourth quarter, the Steelers finished off an 80-yard advance in just four plays. Hanratty (pictured at left) threw to Lewis for 19 yards, Harris ran for four yards around end, and it was then Hanratty to McMakin for 15 yards and to Shanklin for a 42-yard TD. Gerela added the game-tying point after. A 41-yard drive in ten plays by the Broncos that featured Little’s running and short completions by Charley Johnson ended when Turner kicked a field goal from 46 yards that hit the cross bar but bounced over, putting them ahead by 16-13. On the ensuing kickoff, HB Steve Davis fumbled and the Broncos recovered at the Pittsburgh 27. Little was stopped for a three-yard loss on first down, but FB Joe Dawkins ran for 25 and, three plays later, Denver capitalized when Johnson tossed a two-yard touchdown pass to TE Riley Odoms. Turner converted to put the visitors ahead by ten. It was too much for the Steelers to recover from and the Broncos held on to win by a final score of 23-13. Pittsburgh led in total yards (300 to 257) while the Broncos had more first downs (20 to 12). Denver outrushed the Steelers (184 to 83) while the home team compiled far more net passing yards (217 to 73). Pittsburgh turned the ball over three times, to none by the Broncos. Charley Johnson (pictured at right) completed 13 of 20 passes for 86 yards and a touchdown with no interceptions. 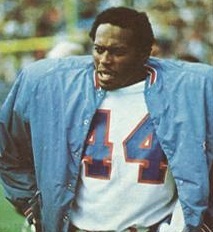 Floyd Little rushed for 88 yards on 27 carries that included a TD and also had four catches for 23 yards. Riley Odoms topped the Denver receivers with 6 pass receptions for 47 yards and a touchdown. 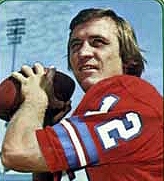 For the Steelers, Terry Hanratty was successful on 10 of 19 throws for 217 yards and a TD while also not being picked off. 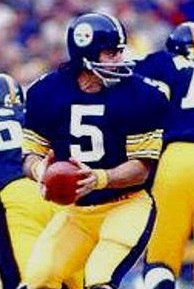 Franco Harris gained 53 yards on 11 rushing attempts. John McMakin caught three passes for 64 yards and Ron Shanklin also accumulated 64 yards on his two receptions that included a touchdown. The Broncos split their last four games and, while they failed to make it to the playoffs, the resulting 7-5-2 record placed second in the AFC West and was the first winning season in franchise history. The hobbled Steelers lost their next two contests but won the last two to end up at 10-4 and second in the AFC Central, although still good enough for a Wild Card playoff berth. Pittsburgh lost to Oakland in the Divisional round.